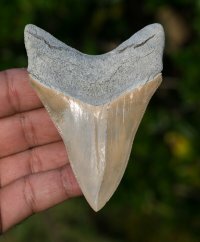 FINE Lee Creek Megalodon Shark Tooth [MEG2082] : Fossils Online, Welcome! The mine in Aurora has been closed to collecting for years now. 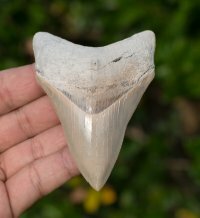 The availability of these highly collectible and desirable teeth has been very sparse, to say the least. 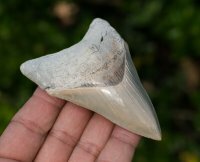 This sharply serrated lower jaw tooth has nearly perfect serrations including the tip. An attractive, symmetrical shape and nearly flawless bourlette. 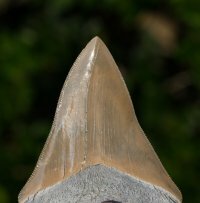 The serrations are unusually fine. Measures 4.75" x 2.65"